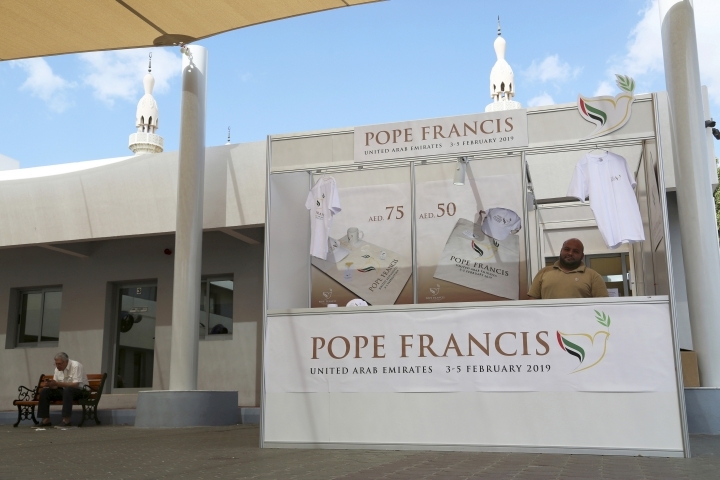 DUBAI, United Arab Emirates — The United Arab Emirates has branded a bridge, a new ministry, a family day at the park and even the entire year of 2019 under the banner theme of "tolerance," an elaborate effort that's in overdrive as the country prepares to host Pope Francis starting Sunday in the first-ever papal visit to the Arabian Peninsula. The state's tolerance-themed project, however, has hard limits. While allowing churches and other places of worship to exist, and marking holidays like Christmas, the Hindu Diwali and Chinese New Year with festivals and celebrations, the government has simultaneously stomped out critical political expression in the name of national security. And while the law prohibits religious discrimination and guarantees the freedom to exercise religious worship, the state's official religion of Islam is tightly monitored and controlled. The UAE's Minister of Tolerance, Sheikh Nahyan bin Mubarak Al Nahyan, said the government is simply doing what "we think is right for our people and for the world." "We are trying to protect our religion," he told The Associated Press in an interview last week. "We want to restore our real religion, which stems from our holy book the Quran, which believes in living together. It believes in the dignity of a human being." Government bodies, public relations firms and even banks have been busy promoting the state's version of tolerance in preparation for the pope's visit, which includes a meeting on Monday with Sheikh Ahmed el-Tayeb, the grand imam of Al-Azhar, Sunni Islam's foremost religious institution, and a mass on Tuesday before 135,000 people in Abu Dhabi. In a video message translated into English and Arabic ahead of his arrival, Pope Francis described the UAE as "a country which strives to be a model for coexistence and human fraternity, a meeting point of different civilizations and cultures. A place where people find a safe place to work, live freely and where differences are respected." The UAE has a Hindu temple in Dubai and a large one being built in Abu Dhabi on land donated by the country's rulers to help accommodate the roughly 3.3 million Indians who live in the country. It is also home to around 1 million Catholics, including a sizeable Filipino community. In addition to several Catholic churches, there are numerous churches in the UAE of other Christian denominations, a Sikh temple and a space for Jewish worship. Still, the U.S.-based Freedom House notes that more than 85 percent of the UAE's population consists of foreign residents who lack political rights and electoral opportunities, including tens of thousands of stateless residents— known as Bidoon. The UAE has branded the Muslim Brotherhood a terrorist organization, viewing it as a threat to the country's system of hereditary rule. "They're certainly not tolerant of any form of political dissent," Devin Kenney, researcher on the UAE for Amnesty International, said. "I mean OK, sure, like bars exist and people of multiple faiths are allowed to practice their faiths so it's not culturally totalitarian but it's clearly not a really tolerant place," he added. Kenney said the pope's visit "seems like a fairly straightforward PR gesture." In recent years, the UAE named dozens of individuals and some 80 groups as "terrorist"— many for their alleged ties with the Brotherhood, which is not deemed a terrorist group in Europe or the U.S. In a statement to the AP, Islamic Relief said it is not connected in any way to the Muslim Brotherhood and that the allegation has been "hugely damaging." The group said it was never provided with any evidence by Emirati authorities to substantiate the assertion and has tried to contest it in UAE courts. "All our attempts to get an open hearing in front of a judge have been rejected on procedural technicalities," the group said. "Nobody's perfect in this world ... ," Al Nahyan, the tolerance minister, said. "We're proud of our acceptance, tolerance, respect for human dignity, having laws which protect everybody's right."